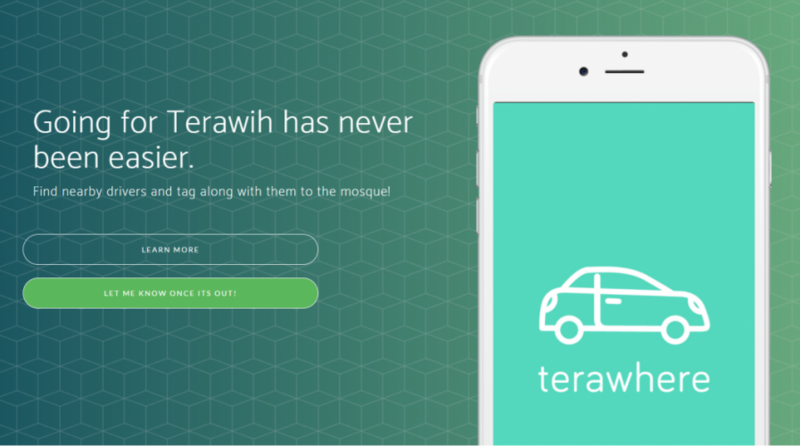 COINCIDING with the first day of Ramadan this weekend, a free carpooling app called Terawhere will be launched in Singapore for Muslims looking for a ride to the mosque during the holiest month of the Islamic year. The app is the brainchild of 15 young people who wanted to create an app to help fellow Muslims navigate the busy roads filled with the faithful. The app draws its name from the “terawih” prayers, the central worship time on Ramadan nights. The app has seen a surge of popularity, with 400 passengers and drivers signing up via a link provided by the app’s creators, said a co-developer, Tengku Muhammad Hafidzuddin, who is part of the group which called themselves MSociety, to TODAY. During prayer times, drivers can key in locations and times, as well as share car plate numbers and the colors of their vehicles. The information can be used by passengers to locate the most convenient driver. The app can also direct the drivers or passengers to the location of the nearest mosque or prayer room. Speaking to Tech Wire Asia, MSociety said the idea for the app came to mind because the team had not yet made an app together, and wanted to give it a shot. Since Ramadan was coming soon, they saw it as an opportunity to work together. She said there would be no monetary exchange between the driver and the passengers to allow people to come together. Singapore’s Minister-in-charge of Muslim Affairs Yaacob Ibrahim praised the app’s simple but elegant idea, saying the app solves many problems, as well as does important community building work at a time of great importance for Muslims everywhere. “There are a (few) more improvements they have to make, but I think the idea of carpooling and sharing, especially during Ramadan, is certainly a wonderful idea, not only to save the environment but also to build communities,” he told reporters on Monday, according to TODAY. Ramadan is considered a particularly busy time of the year, with nightly prayers and large crowds searching for a location to break their fasts in the evening. Tengku Hafidzuddin noted although the app only allows for journeys to mosques, it’s not inconceivable some parties might arrange transport home as well, as noted by Berita Harian. MSociety is a group of young Muslim developers who came together with the aim to hone their technology development skills by “learning from each other and through developing innovative tech solutions for the community”, according to a statement from the team. Terawhere is not MSociety’s first venture together. The group has previously made “Mahram Check”, a service that aims to help Muslims identify any incestuous ties between men and women, as well as “Dhikir and Doa – Quran”, an interface with over 200 prayers.